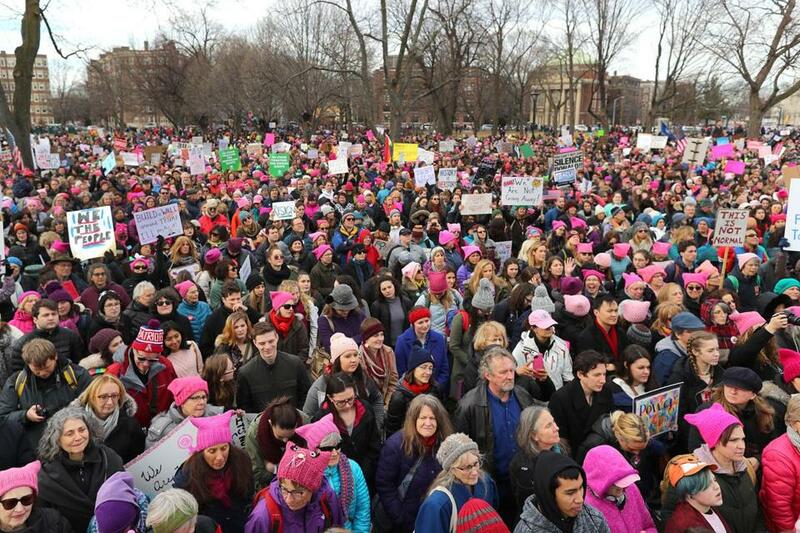 Thousands fill Cambridge Common during a Women’s March on Jan. 20. ACLU Massachusetts sued the city of Cambridge last week on behalf of local organizers of the Women’s March, who say they were charged thousands of dollars for police details and emergency medical services for which they never agreed to pay. Massachusetts Peace Action, one of several organizations that planned the Jan. 20 march, called the charges an impediment to free speech. Louis DePasquale, the Cambridge city manager who, along with the city, is listed as a defendant in the lawsuit, declined to comment through a spokesperson, who cited the pending litigation. DePasquale also wrote that he would continue to work with the ACLU on a resolution. Cunha said the group did not agree to pay for police details or emergency medical services at the march, which was one of hundreds across the country timed to coincide with the anniversary of President Trump’s inauguration. Up to 10,000 people attended the event. The legal complaint says Massachusetts Peace Action was told just two days after the march that the group would be charged $4,000 for the city-provided services. Cunha said city officials had, in meetings prior to the march, mentioned there may be charges. Then, on the day of the march, Cunha said, she was handed a document to sign agreeing to pay bills for public safety charges, and she declined. When asked about the lawsuit, Cambridge Mayor Marc McGovern responded in a statement that he was “proud” to speak at the January march and has been following this situation closely. “My impression has been that the city and the organizers have been working closely to resolve this issue and I’m confident that a resolution will be reached,” he said. But Ruth Bourquin, an attorney for the ACLU who is representing the organizers, said that the charges amount to a violation of the First Amendment’s prohibition on limiting the contents of speech, and that the current political environment makes this issue even more pressing. “Particularly in these times when there’s a need for people to congregate and share these views and concerns and opposition, to impose unconstitutional charges on their right to do so has a chilling effect on the public’s ability to participate in this very basic way,” she said. Cunha said that her organization is not “vilifying” the city, and that throughout the planning process they had a “good working relationship” with Cambridge officials. Cunha and Bourquin both also said they hope the issue can be worked out with the city before hearings begin later this month. “We are hopeful that the city will see the light and they will suspend the policy and it will be seen as a positive thing for everyone, especially those that care about the First Amendment,” Cunha said. Jamie Halper can be reached at jamie.halper@globe.com. Follow her on Twitter @jamiedhalper.